I should have noted that Western and Clark's Grebes have red irises (described as scarlet in Bird of North America online)as shown in this pic. Additionally, both Eared and Horned Grebes also have red/scarlet irises. One of the regular blog readers mistook this for the artificial "red eye" sometimes caused by photography. Many birds have eyes of various colors including yellow, white and black as well as red. 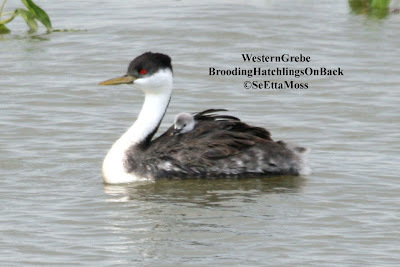 Both Western and Clark's Grebes engage in "back-brooding" of their young--after the young hatch, they climb onto their parent's back "within minutes of hatching" according to Birds of North America (BNA) online. They remain sheltered within the feathering on the back of either the mother or father, who take turns brooding the young. As these pics show, the baby grebes will sometimes stick their heads up to look around. The hatchling grebes can be seen better by double-clicking on the pics to enlarge. I took these pics yesterday at Lake Henry, which is located north of La Junta. 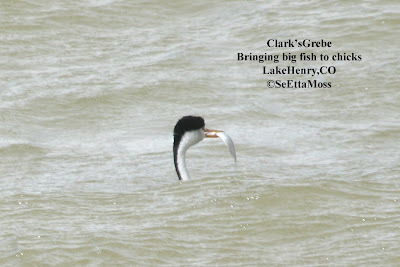 This year a vegetative mat formed on part of the lake and hundreds of Western and Clark's Grebes began nesting there.